We are very happy to welcome Merlin the Bat to our cast of puppet stars. His name is inspired by both the author/bat conservationist Merlin Tuttle, and the famous wizard Merlin from the legend of King Arthur. The idea for the puppet started in the summer when I felt that the Halloween show needed a new opening story. My wife Lara made the suggestion that I write something that would help children understand bats better, as I had done for bees in our “Bee Happy” show. What a great idea! It tied in with the Halloween theme since bats are often associated with the holiday, and it would give me the opportunity to help children and their families learn more about these amazing flying mammals. To learn more about bats I researched a number of books that I found at the public library. I was very pleased to find many available for both kids and adults. As an extra special learning opportunity, a neighbor of ours brought two big brown bats to our home for me and my family to see up close, photograph, and meet. Being able to see the bats like this was a very cool experience. Thanks, Anita, Eddie, and Bruce! Building the Merlin puppet took me about two to three weeks. On this puppet, I did not use a pattern but used this drawing that Lara made as a reference for the puppet. 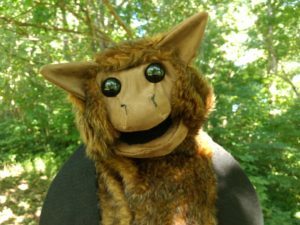 It was a conscious decision to make the puppet appear to be cute, so it would not frighten children who see it on the puppet stage. 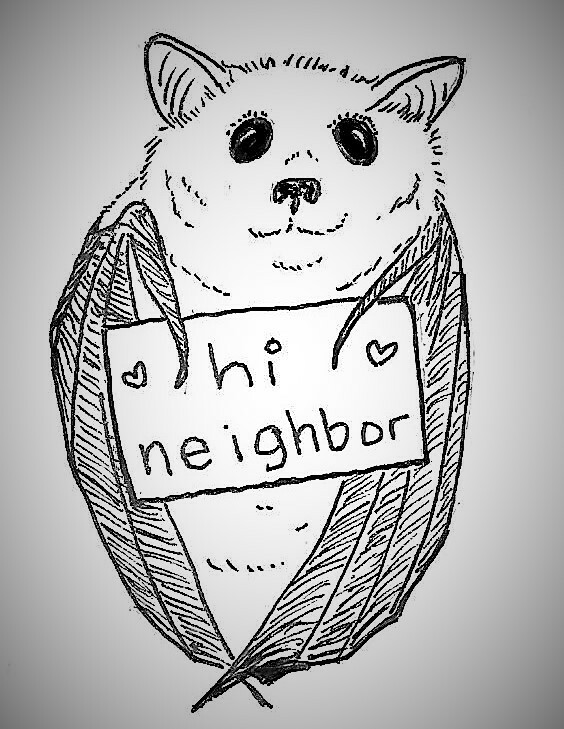 I think that real bats are cute in their own way and hope that kids will agree with me. This puppet was built in three separate sections; the head, the neck tube, and the outer body. While I did encounter a few obstacles in the building process, which were probably brought on by not using a pattern, I am very pleased with the finished puppet. Visit the Wump Mucket Puppets Instagram page to see more photos and videos of Merlin through the building process.